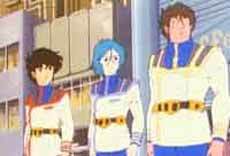 Notes: The original Japanese series, Macross, is available separately from AnimEigo. 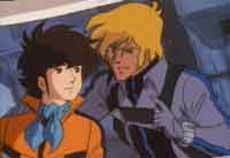 This review pertains to the North American edited version (Robotech), which was combined with the unrelated series Southern Cross and Genesis Climber Mospeada to form a saleable television commodity for American broadcast television, with a new script from Carl Macek. 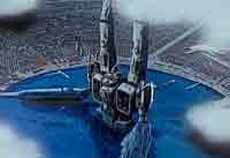 A long time ago, a huge battleship crashed from outer space onto the island of Macross. None of the beings on the ship survived. 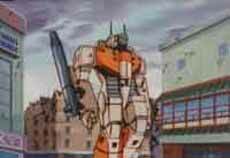 However, several years after, a city had built itself around the wreck, which itself was being restored by the inhabitants of Macross Island. 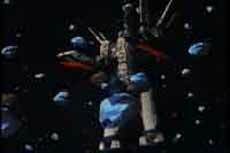 When unknown forces attack, the people of Macross Island must face the threat with all resources available, including the alien ship. 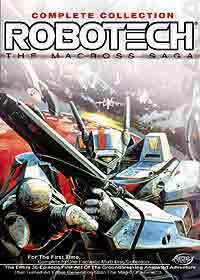 Robotech will be regarded as an anime milestone by many anime viewers today. That's far from undeserved. The art and animation is decent enough. This title is showing its years, mostly in the art style and animation. For an old schooler like me, that doesn't really mean anything, but it should be mentioned anyway. Since I only have the Carl Macek version available to me, I can't really say what has been changed from the original. The VA's are actually good, with one exception. 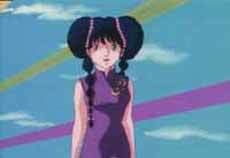 Yes, I'm talking about Lynn Minmei. Reba West's rather giggling and ditzy performance is annoying enough at times, but her singing ... oh, her singing is pure evil. And since her songs are played again and again and again...... and again, you will do well in wearing a helmet when watching this, if just to keep your hair where it's supposed to be. On that note, I really have to say that the music in this series is probably the only thing bad about this series. None of it is particularily notable and even the simplistic intro theme -- which is also the theme that gets played again and again and again when something heroic or daring happens -- gets annoying really, really quick. Now, the story ... the marvelous story is something else. We practically get immersed into the lives and roles of quite a number of characters, none who I'm gonna go into now, lest I turn the review into a hundred page essay. Characters like Rick Hunter, Lynn Minmei, Lisa Hayes, Roy Fokker, Captain Gloval, Claudia Grant. 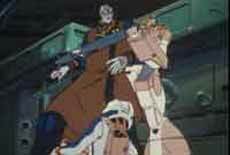 And let's not forget the "other side", the Zentraedi, who are just as interesting a bunch for being enemies. Perhaps that's what is so good about this series. 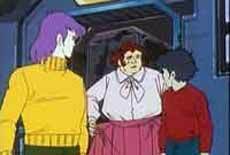 Robotech has an unusually rich cast, and none of them are really typecast. The plot is so full of branches and twists that you won't be bored for a moment. We are practically invited to take part in the life of an entire planet and even its surrounding system. Alliances form and change, enemies learns that there's more to life than constant battle and they in turn teaches us that people can have so many more facets to themselves than first impressions may show you. In fact, this is character development given form, and I can only bow my head in deep admiration. So yes, this IS a milestone for anime and a classic in its own right. And even though it's hardly the first anime I've ever seen, it has so many things going for it that it easily becomes one of my favorites. It never preaches or points fingers. (Well, not too much.) And it never falters either, in the duration of the entire show. So if you think you can survive Minmei's singing, Carl Macek style, go find yourself the box set. You'll be glad you did. Recommended Audience: Well, given the saga's rather rich story, I doubt many of the youngest will understand what's going on (though they'll undoubtly enjoy the flying and shooting in it.) Any violence is kept at a rather non-violent levels, most of them just exploding ships or vessels. Other than that, there's nothing objectionable at all.